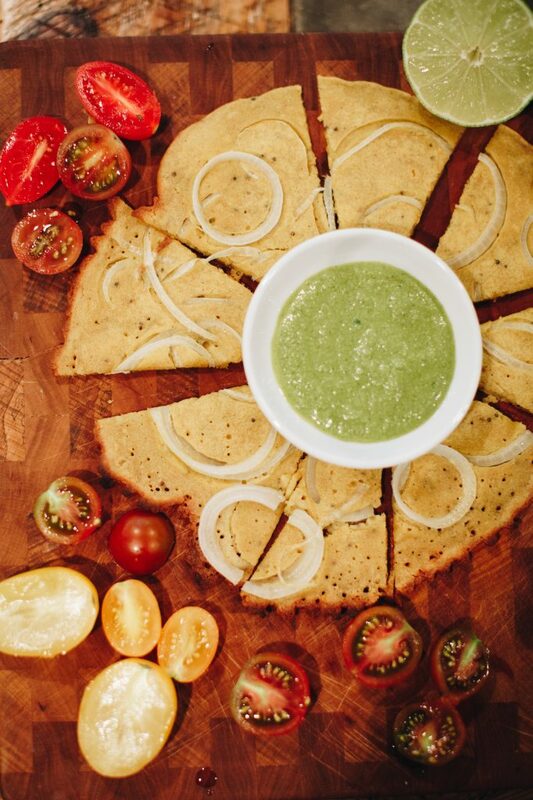 This curried socca is a terrific side dish or appetizer! I really enjoy having an option that is just as satisfying as bread but much healthier. I love to serve this along with my peach chutney or, you guessed it, my salsa verde. Both options are delicious! If I make the salsa verde, I actually make it a little more “mint heavy” as mint and curry are long-time good friends. I found this recipe in one of my absolute favorite cookbooks, “At Home in the Wholefood Kitchen” by Amy Chaplin. I love this cookbook and keep coming back to it for guidance and inspiration in my day to day cooking. 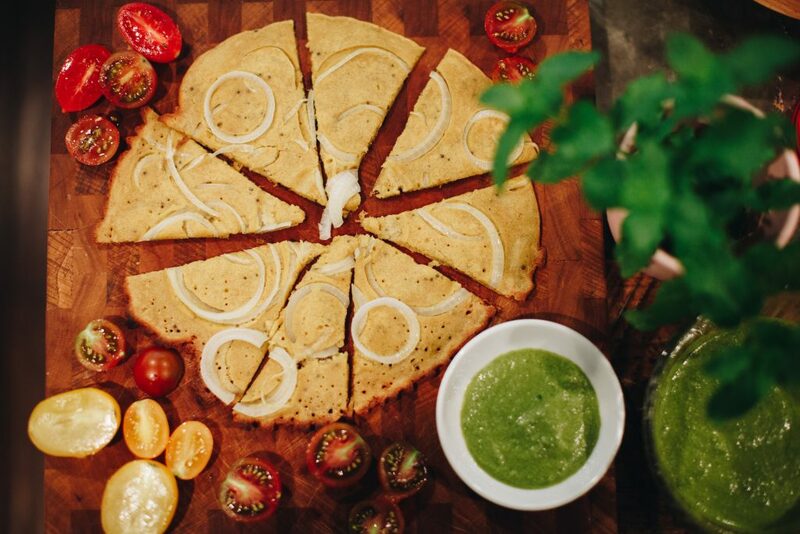 This Socca is delicious and naturally gluten-free, it won’t cause the bloating that so many of us experience after eating glutinous products. Hope you enjoy making it and pairing with tons of yummy foods like grilled meats and veggies. 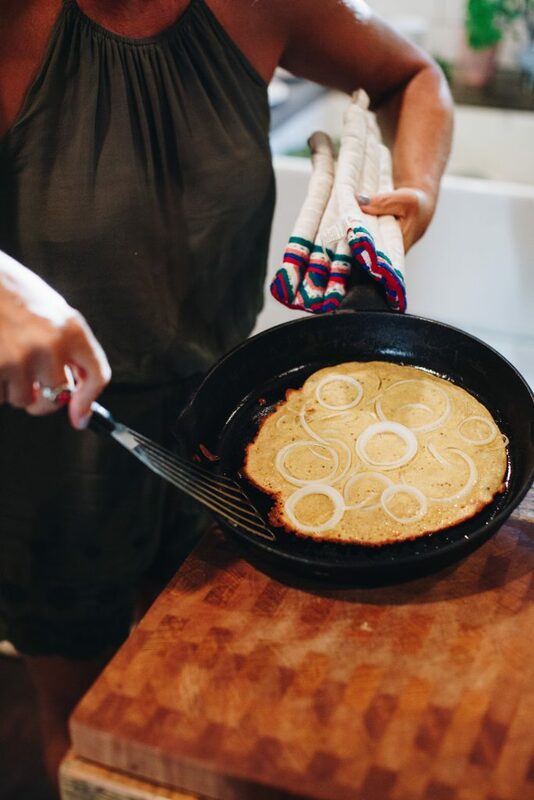 This recipe makes about 6, 9-inch socca. Enjoy! 1. Mix the chickpea flour and salt in a bowl and whisk to combine well. 2. Pour in 1 ½ cups warm water and whisk until completely smooth, then add the remaining water and coconut oil; whisk again and set aside. 3. 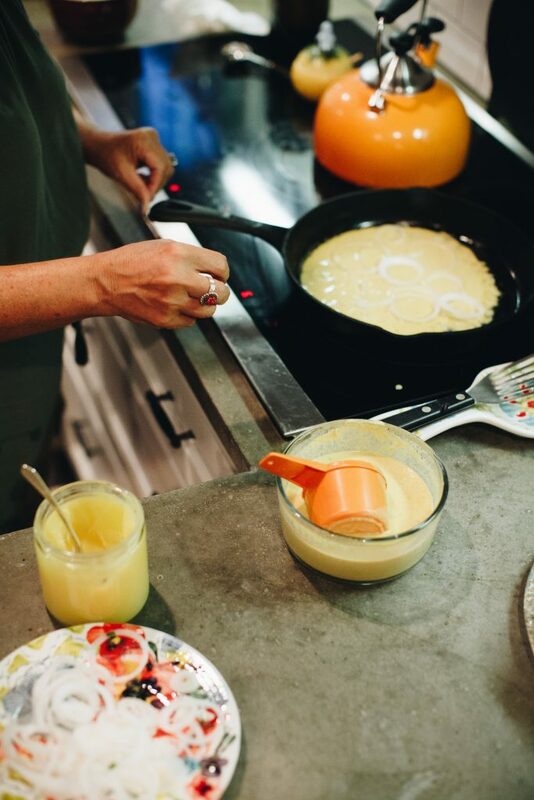 Warm 2 tablespoons of ghee in a skillet over medium heat. Add mustard seeds and cook until they begin to pop, should take about 30 seconds. 4. Stir in curry powder and remove from heat and add to the chickpea flour and water mixture. Make sure to stir well. Cover bowl with a towel and let the batter sit for an hour at room temperature. 5. Over medium heat, warm about 1 teaspoon ghee in oven-proof, 10-inch cast-iron skillet. 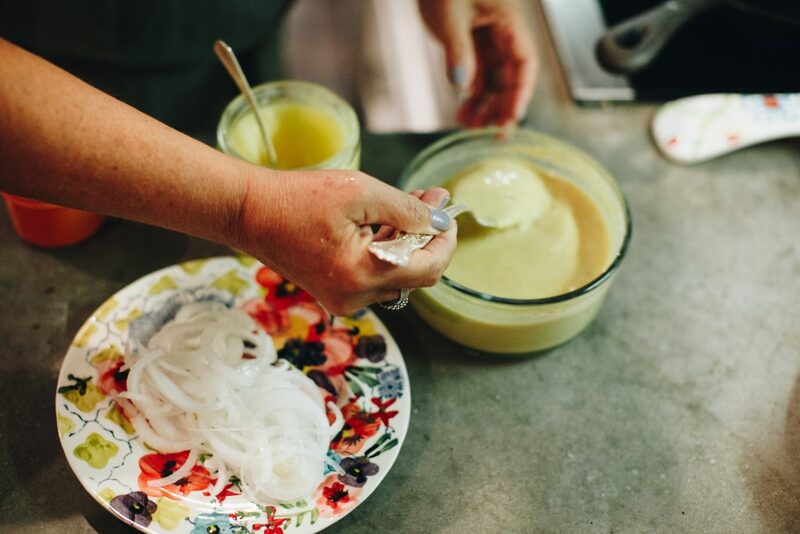 Pour in ¾ cup of your batter and moving quickly, distribute about ⅙ of the onions over the batter. 6. Cook for about 2 minutes or until the edges are set and bubbles start to form. Then place directly under the broiler and cook for 4-8 minutes until the top is beginning to brown. 7. Remove from the broiler (be very careful as the handle will be HOT) and loosen edges of socca with a pallet knife or flat spatula. 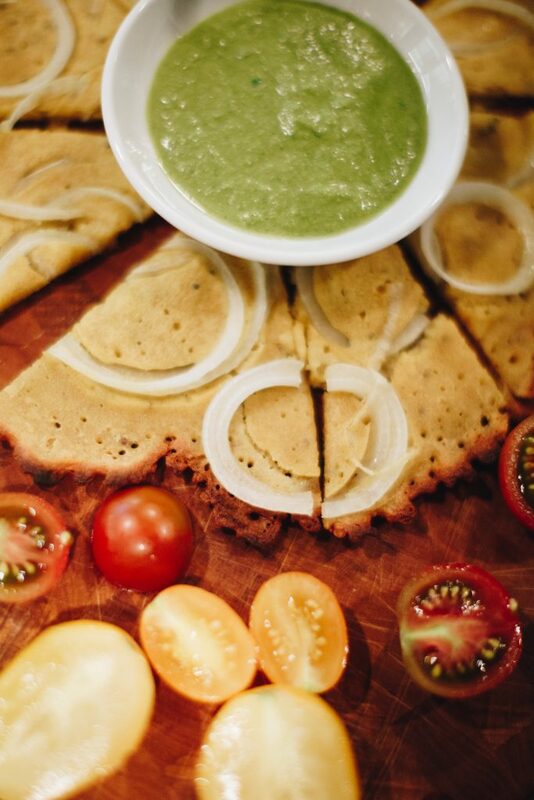 Slide onto a cutting board, cut into wedges and serve immediately with chutney and/or salsa verde. Repeat with remaining batter. Enjoy! Mix the chickpea flour and salt in a bowl and whisk to combine well. Pour in 1 ½ cups warm water and whisk until completely smooth, then add the remaining water and coconut oil; whisk again and set aside. Warm 2 tablespoons of ghee in a skillet over medium heat. Add mustard seeds and cook until they begin to pop, should take about 30 seconds. Stir in curry powder and remove from heat and add to the chickpea flour and water mixture. Make sure to stir well. Cover bowl with a towel and let the batter sit for an hour at room temperature. Over medium heat, warm about 1 teaspoon ghee in oven-proof, 10-inch cast-iron skillet. 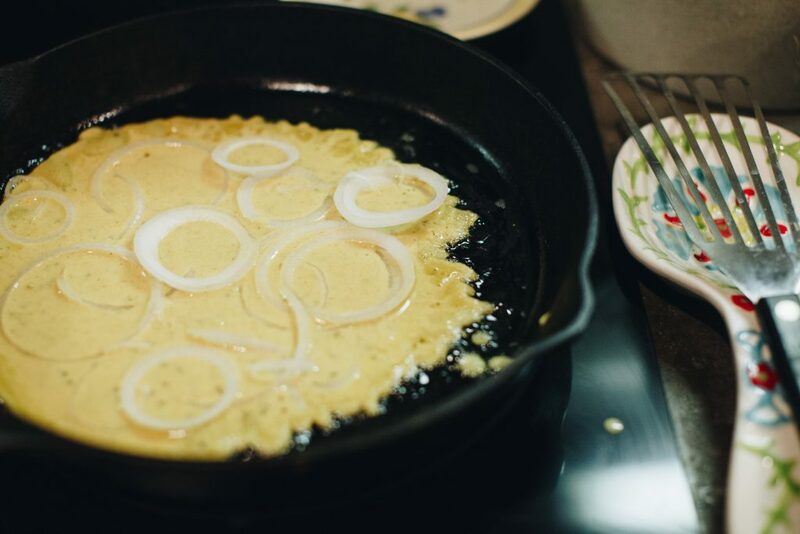 Pour in ¾ cup of your batter and moving quickly, distribute about ⅙ of the onions over the batter. Cook for about 2 minutes or until the edges are set and bubbles start to form. Then place directly under the broiler and cook for 4-8 minutes until the top is beginning to brown. Remove from the broiler (be very careful as the handle will be HOT) and loosen edges of socca with a pallet knife or flat spatula. Slide onto a cutting board, cut into wedges and serve immediately with chutney and/or salsa verde. Repeat with remaining batter. Enjoy!